[UPDATE] If You're Confused About Whether Tealive Is Really Te-Dead, We Explain. Tealive parent company Loob Holding’s ongoing battle with La Kaffa (the owner of the Chatime brand) has reached a crucial point with a successful injunction filed by La Kaffa with the Malaysian Court of Appeal meaning that Tealive now has to shut down its business for the next two years. Loob Holding and Tealive’s request for a stay and leave against this decision has also been dismissed. Their last hope now remains with the Malaysian Federal Court, with which they have filed an appeal to overturn the injunction by La Kaffa. If you’re reading this, there’s a good chance you’ve already read about the latest development in the Tealive (Loob Holding) versus Chatime (La Kaffa) legal struggle. Ever since the two companies began their dispute towards the end of 2016, there’s been constant uncertainty about the fate of one of the most popular—if not the most popular—bubble tea chains in Malaysia. January 2017: It’s made public that La Kaffa (owner of the Chatime brand) and Loob Holding (then master franchisor of Chatime in Malaysia) are in a dispute regarding use of ingredients and materials. This dispute started in 2016. January 2017: La Kaffa terminates its master franchisor agreement with Loob Holding, meaning that Loob Holding can no longer operate Chatime in Malaysia. February 2017: Loob Holding unveils its new franchise—Tealive. Shortly after, La Kaffa files an injunction with Malaysia’s High Court to prevent Loob Holding from selling products similar to theirs. February 2017: It is also revealed that an arbitration process to settle the dispute between La Kaffa and Loob Holding is currently ongoing at the Singapore International Arbitration Centre. May 2017: The High Court dismisses La Kaffa’s injunction against Loob Holding and Tealive, effectively allowing Tealive to operate as usual. June 2018: More than a year later, The Malaysian Court of Appeal approves La Kaffa’s injunction against Tealive, and that Tealive would have to cease operations in Malaysia for two years. Loob Holding and Tealive announce their decision to apply for a stay (a postponement of the decision) and leave so they can approach the Federal Court to overturn this decision. July 2018: The Court of Appeal dismisses Loob Holding’s request for a stay, meaning that Tealive will now be required to shut down. Loob Holding responds again by saying they will finally appeal this decision with the Federal Court. So now back to the question at hand: Is Tealive really about to cease its operations? Short answer: There’s a good chance. Long answer: With the Malaysian Court of Appeals actually greenlighting La Kaffa’s injunction against Loob Holding, Tealive moves a step closer towards a perilous fate of having to cease its operations in Malaysia for the next two years. It’s true that when La Kaffa first submitted a similar injunction (to halt Tealive’s business) with the Malaysian High Court in February last year, the decision ended up favouring Tealive. According to Judicial Commisioner Wong Kian Kheong who explained the decision back then, the injunction was dismissed on the grounds that it would negatively affect the livelihoods of Tealive’s franchise owners and all of its 800 employees. With that, we thought things were settled, with only the arbitration process in Singapore left to determine the settlements that still needed settling. On June 27, Tealive and Loob Holding came out to announce that they were hit with an injunction filed by La Kaffa with the Malaysian Court of Appeal that effectively meant they would have to cease all of Tealive’s operations in Malaysia. This time, La Kaffa were successful. According to Justice Hamid Sultan Abu Backer from the Court of Appeal, the previous decision by the High Court (which is a level lower than the Court of Appeal) to allow Tealive to continue operating in Malaysia was a mistake. “The complaint of La Kaffa in crude terms means that Loob had changed the Chatime business overnight to Tealive,” he said. The response by Loob Holding to this injunction was to immediately file for a stay and leave to appeal to the Federal Court to allow them to continue operating as usual, which they did promptly. This appeal was then dismissed just yesterday, meaning that the decision by the Court of Appeal still stands, and that Tealive will now have to cease all its operations across Malaysia for the next two years. After all this, Loob Holding now has only one option left in order to save their Malaysian business—take it up with the Malaysian Federal Court and hope that they decide to overrule the injunction by La Kaffa. This they have already done, and now they await the decision that could decide the fate of Tealive and its existence in Malaysia. “The company has instructed its lawyers to file for leave to appeal to the Federal Court against the Court of Appeal’s decision given on June 27 2018 and it has been informed that the application had been filed yesterday,” a statement from Loob Holding said. It has not been stated when exactly the Federal Court will return with a decision regarding Loob Holding’s appeal. Right now nobody can predict what the outcome will be, but the sentiment surrounding this particular legal battle at this juncture is that Tealive is in very real danger of having to shut its doors for a lengthy period of time. 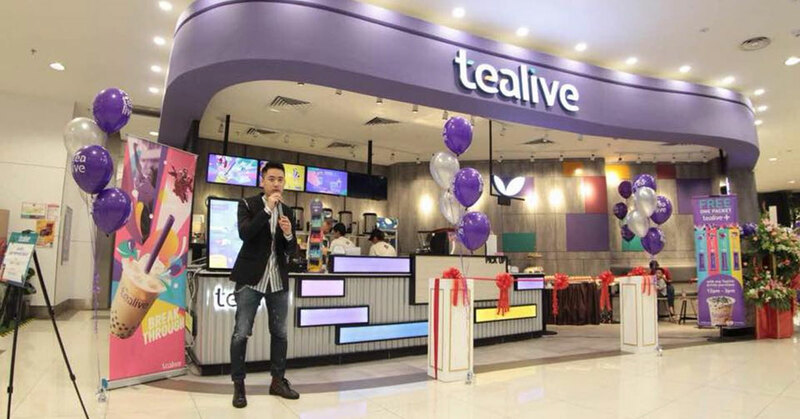 Already, Chatime in Malaysia (now operated by the Will Group) have already expressed their willingness to help out existing Tealive franchisees and employees in the event some of them are left stranded. “We would welcome former Chatime franchisees and employees, who have been affected by the whole ordeal, to contact us should they require assistance from us,” said Aliza Ali, group managing director of Chatime Malaysia. As for what this means for the Malaysian business community, the situation is a bittersweet one. One on hand, Malaysia could be faced with the demise of an iconic name in the F&B industry. On the other, hand this decision also outlines a local legal system that is willing to make tough decisions when it comes to maintaining the integrity of business law. We expect more to happen in this saga within the coming weeks, and will continue to update our readers with developments as they happen. 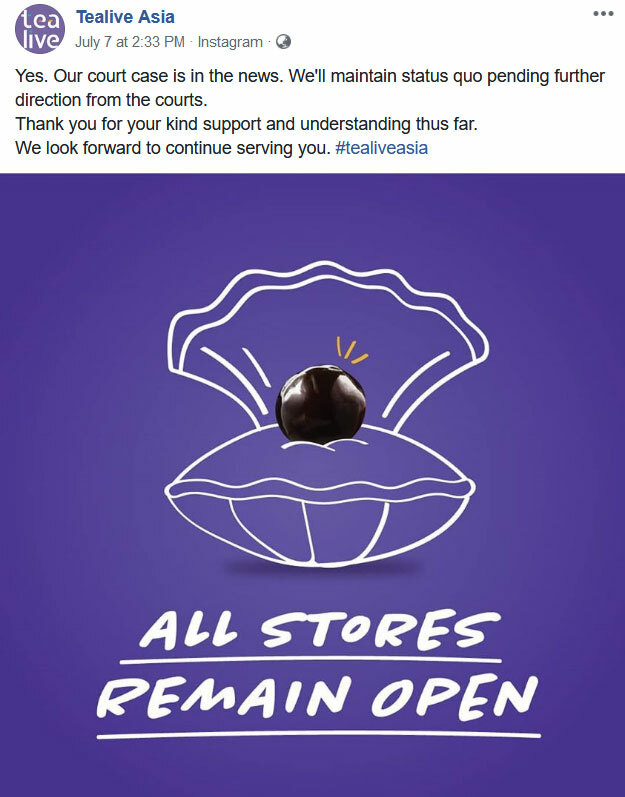 Update (July 7, 2018): Tealive have released a statement on their Facebook page maintaining that for them, business will continue as per status quo pending further directions from Malaysia’s courts. You can view their full statement below. A screenshot of the original statement from Tealive’s official Facebook page. For all our coverage about Tealive, check out our previous articles.